Welcome back to the IDP Streamer series. Offensive streamers get a lot of attention in fantasy football but for those that play in IDP leagues, the defensive side is equally important. And now that we have a week’s worth of games to play with, we have a ton of options to pore over. As always, we’ll break it out by the three main groups — lineman, linebacker, secondary — and, in future weeks, we’ll review how we did the previous week. Let’s get to Week 2 streamers. While Cameron Jordan gets most of the attention on the Saints line (and rightfully so), opposite him are two players who are fully capable of getting to the quarterback. Okafor and Davenport were in an obvious rotation last week with Okafor playing about half the snaps and Davenport about a third. Their stat lines left more to be desired, with only Davenport able to record a quarterback hit. But both will have plenty of chances this week when they play a Browns team that just allowed seven sacks on Tyrod Taylor to a Steelers defense that averaged three last season. For deeper leagues, it’s more likely just Davenport is available but if Okafor is, he would be the choice based on the seniority he’s seeing on the snap count. It’s not hyperbole to say Hunt had the game of his life in Week 1 after recording two sacks against the Bengals. After all he nearly matched his five-year career-total in one game. But while it may seem like a fluke, there’s a good chance Hunt could at least tally another sack this week. For starters, he played the most snaps (76 percent) of any Colts lineman last week, a point that is essential to any IDP player. Hunt draws a matchup against the Washington Redskins who not only allowed three sacks last week against Arizona but did so on just 30 pass attempts. Their offensive line also ranked just 20th last week in PFF’s pass-blocking grades. Oh and let’s not forget who got one of those sacks for Arizona— defensive tackle Robert Nkemdiche. Hunt also plays defensive tackle and will be even more valuable for leagues that award extra points for the position designation. I play in several IDP leagues and Hunt is still available in over half of them. Another DT designee, Tomlinson gets his fantasy points from the run game, much like his fellow Giant lineman Damon Harrison. Tomlinson started off well last week with five solo tackles and two assist for seven total, one more than Harrison while also playing one more snap than Harrison, leading all Giants linemen in snap count share at 73 percent. The Giants play Dallas Sunday night and Tomlinson will have plenty of chances for fantasy points. First, in the aforementioned running game, the Giants are facing a team that ran the ball 30 times against them last year. If that wasn’t enough, the Cowboys gave up a whopping six sacks last week to the Panthers including two to interior lineman Kawann Short. The Cowboys were dreading playing without center Travis Frederick before the season started and now that dread has turned into a horrible reality of which Tomlinson should take advantage. If Riley hasn’t been picked up in the wake of the injury to Deion Jones, pick him up now. Riley is the first man up and will see plenty of action against the Panthers this week. Jones, the player Riley is replacing, played on an incredible 96 percent of the snaps last Thursday despite apparently suffering a foot injury that’s now knocked him out of at least the next two months. Riley will see plenty of tackle opportunities between quarterback Cam Newton, who ran 13 times last week, and running back Christian McCaffrey who saw nine targets. Campbell may be available as well since he’s not a traditional MIKE linebacker but he still played on 99 percent of the snaps last Thursday. Either one will make a fine streaming option for this week. For a player cut during preseason, Parker rebounded nicely to have a solid Week 1 and should be available in most IDP leagues. He was an afterthought, even for real-life NFL teams, as late as last week but then the Chiefs’ secondary started dropping like flies. Safeties Eric Berry was/is not quite recovered from a heel injury and Daniel Sorensen suffered a significant leg injury that knocked him out of Week 1 and will keep him out at least a few more weeks. Enter Parker, who played 100 percent of the 82 defensive snaps for the Chiefs last week while totaling nine tackles, two passes defended and a pick. Sorensen is out again this week while Berry is highly unlikely meaning Parker will get another chances to be on the field a ton. It’s a good thing too since he faces a Steelers offense that threw 41 times last week while also averaging 38 pass attempts last year. It could be a shootout in Pittsburgh and you’ll want some exposure. For defensive backs, playing against a team that throws it a lot is what you want and there is no better target this week than the Colts. 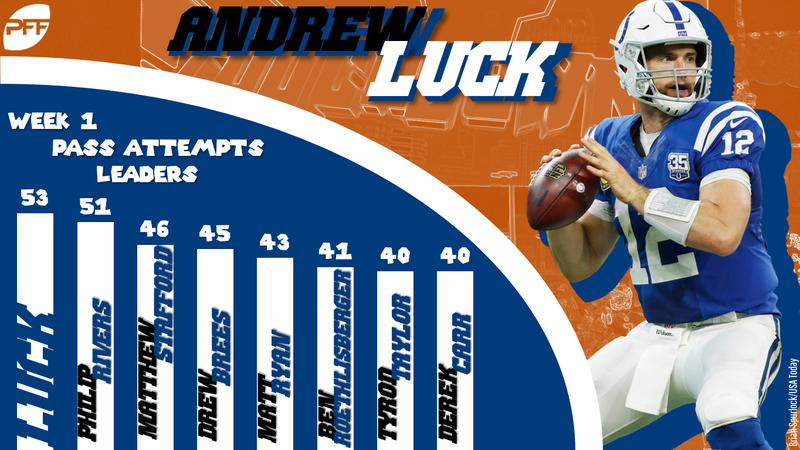 With Andrew Luck back, the Colts threw for a league-high 53 attempts last week against the Bengals. That’s a far cry from the 34 pass attempts Swearinger and Nicholson saw last week against Sam Bradford and the Cardinals. Both still managed five tackles but it’s not what Bengals safeties Jessie Bates (8 tackles) and Clayton Fejedelem (11 tackles) had. The Colts have yet to find a solution at running back and, seemingly, have a healthy Luck back to sling it. This can only mean tons of passes and opportunity for the Redskins secondary. Swearinger is the better bet but, if not available, Nicholson is a good backup option. The four tackles for Diggs last week doesn’t sound like a lot until you consider the opposing offense threw it only 21 times. Diggs literally had a tackle on 20 percent of the Jets’ pass plays! Luckily he was one of only two Lions to play every defensive snap and figures to see even more chances this week. He plays a 49ers team that threw it 33 times last week against Minnesota while averaging 37 attempts last year. Diggs will be owned in a lot of IDP leagues but certainly not all and could come in very handy this week.